The request for the consultation was confirmation that the two families the researcher had found in the 1910 census were indeed the same family. At first, I questioned the assumption (and we know what happens then) that he had two actual census pages in which the last name of the family was different. In fact, what he sent me were two printouts of abstracts from the census. In each family the given names were the same, as were the ages and the location – and in the case of the servant in the household, her name appeared identically on both lists. 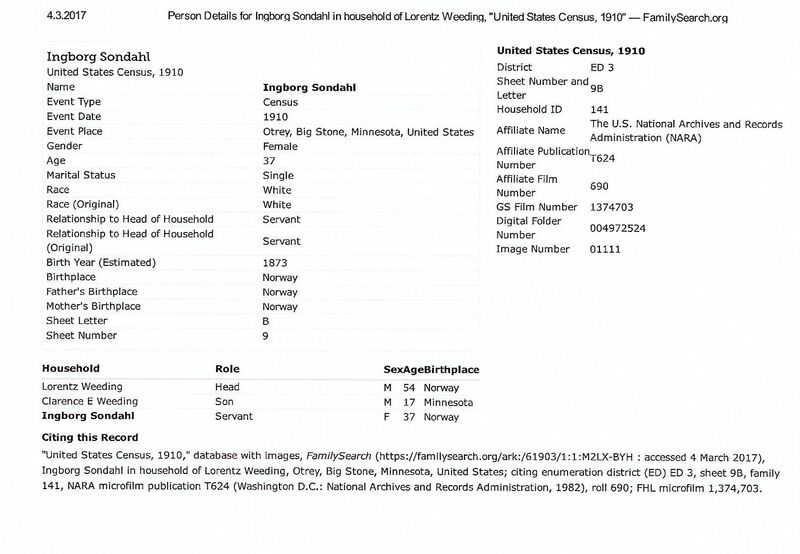 The 1910 household of Lorintz Weeding (age 54) and his son Clarence E. Weeding (age 17) included a 37-year-old servant named Ingborg Sondaln from Norway. The researcher who wanted the consultation had found a FamilySearch.org abstract of this family (see Figure 1, above). However, he believed that he had found Ingborg Sondaln residing with a suspiciously identical family, except in this instance the surname was not Weeding but Luking (see Figure 2). In looking at the records the researcher sent I will admit that I was a little confused. In my case, I was concentrating on the names on the two abstracts, breaking one of my own rules about completely reading a document, not just concentrating on the names. I began to question what was going on and went to locate the two households in the original census. I found the Lorintz Weeding family without a problem, but no amount of creative searching brought forth anything with the Luking surname. 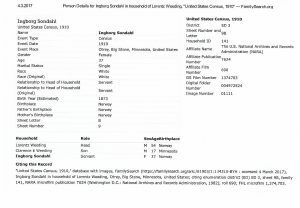 Stepping back for a moment I looked again at the two printouts the researcher had shared and realized the abstract of the Lorintz Weeding family from FamilySearch had everything in English – the headings for each part of the abstract and so on. The abstract for the Luking family, on the other hand, was completely in Norwegian (the native tongue of the researcher). It was then that the lightbulb went off in my head and I went off to Google Translate. I typed in weeding into the English box on Google Translate and asked for the Norwegian equivalent. Google Translate showed me that weeding in Norwegian is luking. It was at that moment that I realized that the “translation” option built into the browser used by the Norwegian researcher had mistaken the surname Weeding as the verb weeding. It had not changed the other names of the members of the household because they were likely not recognizable by the browser as having a Norwegian alternative or, as in Ingborg’s case, were already in Norwegian. [When] working with a browser’s translation function, it treats all text the same. 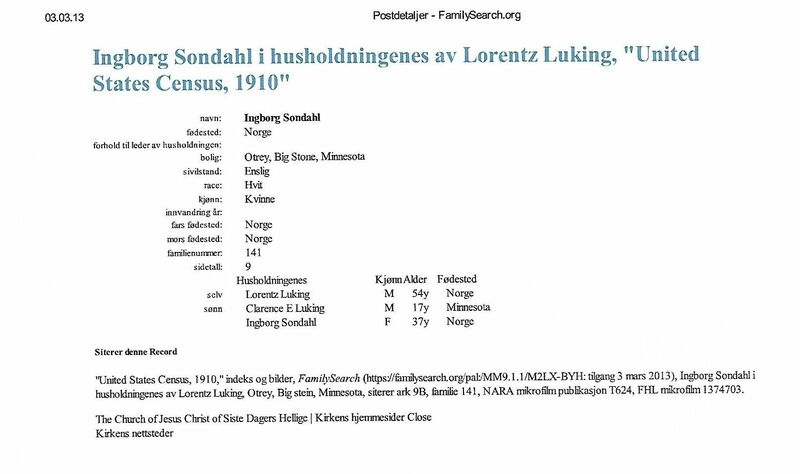 Had the researcher used a Norwegian version of FamilySearch this likely would not have happened, because FamilySearch would not have translated the names as abstracted, only the headings. However, when working with a browser’s translation function, it treats all text the same. 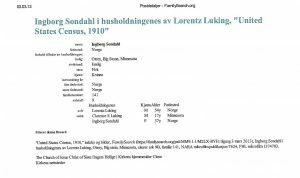 As such Lorintz Weeding and his son Clarence E. Weeding became Lorintz Luking and Clarence E. Luking, and to the researcher it appeared as though Ingborg Sondaln was in two different but similar families at the same time. Moral of the story? Try to use built-in browser translation as sparingly as possible, certainly. But, more importantly, always go to the original record. I am always deeply skeptical about Google Translate. I can read German, and sometimes, just for fun, I type something into Google Translate, which spits back a literal word for word translation. In many cases, the translation would be incomprehensible to anyone who didn’t know any German. A similar phenomenon is found in actual census records when the census takers (or the families themselves) translate foreign names into their English equivalents. In early California records, some distant family members whose surnames was “Blanco” got enumerated as “White,” and German family members in Illinois whose surname was “Hoch” were listed as “High.” In the latter example, some members of the family did make that change permanently. My aunt has been in the genealogy trenches for nearly 40 years, and being a Real Librarian she has traveled and found hard copies and microfiche etc. In the short amount of time I have been looking into my ancestors, I found that being able to read in Latin, Italian, German, French, and English has helped immensely. One of my grandfathers changed his name to Anglo-cize it and it wasn’t till I put his name into what it would have been in Norwegian that I hit paydirt. Still going to need a trip to Trondheim to Officialize it. Found the “French” grandfather was really Italian! The McClures though, have really stuck it to my aunt and now to me with a Stephen who has no records anywhere of birth or parents. I’ve resorted to reading the history of the county in KY where he was supposedly born in hopes of figuring out a migration pattern that might help.